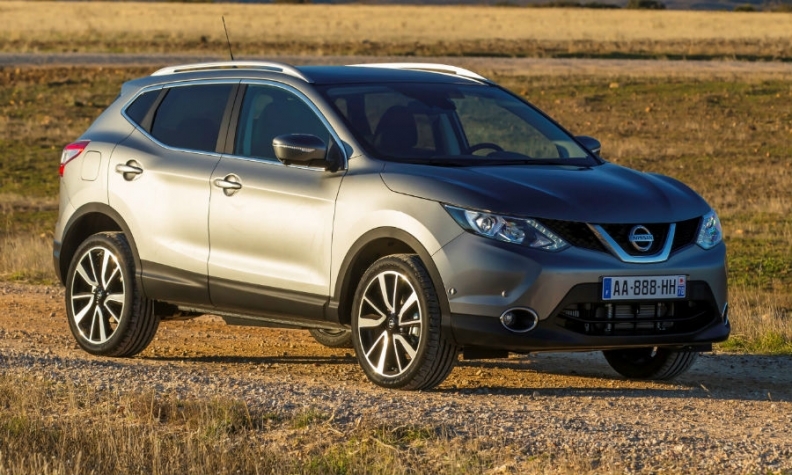 The European rollout of the new Qashqai, shown,is helping Nissan. YOKOHAMA, Japan — A rebound in Europe helped to boost net income at Nissan by 5 percent in the January-March quarter. Surging North American operating profit also fueled the company's earnings. Revenue gained 21 percent to 3.20 trillion yen ($31.13 billion), from a year earlier, as worldwide sales advanced 18 percent to 1.52 million vehicles. Nissan's vehicle sales in the EU and EFTA markets increased 7 percent to 129,943 in the January to March period for a 3.9 percent market share in a total market up 8 percent, according to industry association ACEA. The rollout in the quarter of the latest generation Qashqai compact crossover, the automaker's best-selling European model, helped to boost sales. CEO Carlos Ghosn said a focus on brand image and product launches bolstered both sales and profits in North America. He cited the redesigned Rogue crossover, which went on sale last year and is the first vehicle based on a new commonized Renault-Nissan platform, as the kind of vehicle that will drive results. For the full year ended March 31, net income increased 14 percent to 389.0 billion yen ($3.78 billion), while operating profit added 14 percent to 498.4 billion yen ($4.85 billion). Nissan forecast a 4 percent increase in global net income to 405.0 billion yen ($3.94 billion) and a 7 percent increase in operating profit to 535.0 billion yen ($5.20 billion).